There are many factors that come into play when choosing the right desk for your office. One of the most important factors in choosing office desks is the reputation of suppliers. Contractors offer different services such as delivery, installation, planning, design, logistics, and storage. Each of these services is important to organize your office space. It seems very rare to find a home office that doesn't have a computer of some kind. A computer desk is an important piece of furniture for any home office as it's going to form the cornerstone of your working environment. Here's some tips for the next time you go shopping for a computer desk. A height adjustable desk is the pinnacle of computer desks for your office. For what? Because we all come in different shapes and sizes and one desk generally doesn't fit all. 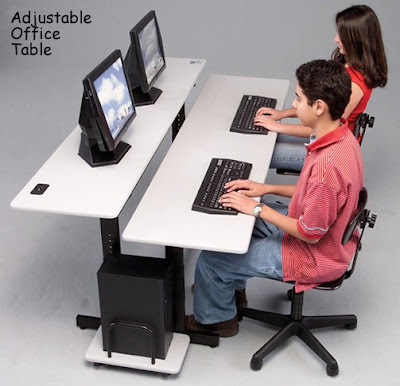 If you can't find a height adjustable desk then make sure you have more than ample leg room underneath the desk; your legs should not be cramped or restricted in any way. Having a desk that's the wrong height can make working on it an absolute nightmare. It can lead to bad posture while working. The latest trend in ergonomic office space is the adjustable height desk. Also called as sit stand desk, these desks give employers and their people the option of having a customized office workstation without having to lay cost on a different variety of systems. Once you choose a design that you think will fit the office, your employees can have a uniform table design and still give them the ability to customize of these table. Some computer desks come with a sliding tray for your keyboard and mouse. Make sure that your keyboard is between 28 and 30 inches above the floor. Any lower than that and you're going to wind up slumped over your keyboard whilst typing which is going to lead to back problems and, potentially, repetitive strain injury (RSI). The monitor also needs to be a suitable distance from your eyes to prevent eye strain. How to measure this? Simply sit upright in your office chair and stretch your arm outwards. The screen should be positioned at the far end of your reach i.e. you should be just about able to touch the screen with your fingertips. The computer obviously has a monitor of some kind and the height the monitor is placed at whilst you're working is equally important. Mmost new computers are only sold with flatscreen monitors anyway; most of the new LCD monitors (flatscreen) are height adjustable so getting this level right shouldn't be a problem with this type of screen. This will prevent you looking upwards or downwards while you work. Another key point with a good computer desk is storage space. There's nothing more annoying than having to stop what you're doing and go searching for a stapler or notepad. Working space is another key factor. You won't always just be typing at your desk. Your desk should have enough room for this and more. Many people buy a desk without taking this aspect of working from home into account - you can never have enough space on you desk; more is always better. So do not take the task of buying your computer desk for granted - it's an essential item in any office so make sure that you're making the right choice first time around. Although choosing office equipment is largely dependent on cost, you must not underrate the value that office furniture brings to enhance a positive working atmosphere. Do not underestimate the rewards of a happy and productive workforce.